As the opening of the Boatrocker Barrel Room nears, the number of barrel aged beers from the Braeside brewery is increasing in frequency. 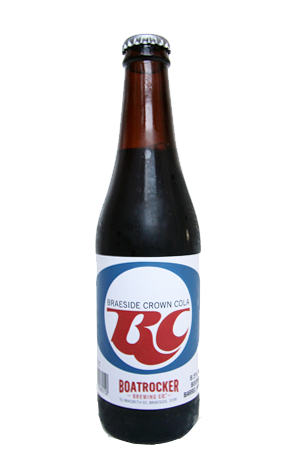 Following closely on the heels of Adventus and Roger Ramjet comes Braeside Crown Cola, a beer that borrows its look and, to a degree, some of its flavour characteristics from Royal Crown (or RC) Cola. The brewers started out by making what they call "a classic Scotch ale" – a big, chewy, malty style – that used a yeast from a Scottish brewery. Those familiar with such beers, and English old ales, will be aware that they can share characteristics with dark Belgian ales, such as dubbels, in their layering of rich, sweet, fruity flavours and aromas. And that's the case here. Said Scotch ale then spent time in bourbon barrels for three months, which is presumably where the inspiration for the nod to RC Cola came from as they reckon the end beer is reminiscent of "a mighty fine bourbon and cola". We'd like to think it's a step above what you'd find in a can of RTD (admittedly, they did say "mighty fine" so we can discount Cougar...); creamy caramel, a dark herbal blend and burnt sugar create a sort of sweet, condensed cola, with the bourbon adding a spiciness that's most noticeable in the aftermath.